The classy Dan Wesson Model 715 double-action revolver is back in production. For revolver lovers, that is welcome news. This highly accurate Airgun replica features all the details that you find on the real firearm. From the one-piece 4-inch heavy barrel, complete with vent rib with threading for mounting accessories, to the Hogue rubber grip. The grip shell has an ingenious integrated tool for tightening the CO2 cartridge that powers the revolver. Even the forward cylinder latch and the clockwise rotation of the cylinder have been precisely replicated from the real firearm. 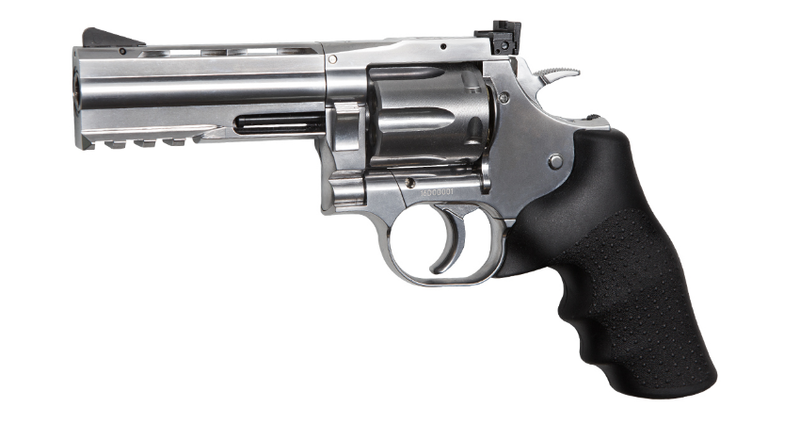 Dan Wesson revolvers became legendary as the preferred choice of serious revolver hunters and competition shooters because they were extremely well made and accurate.